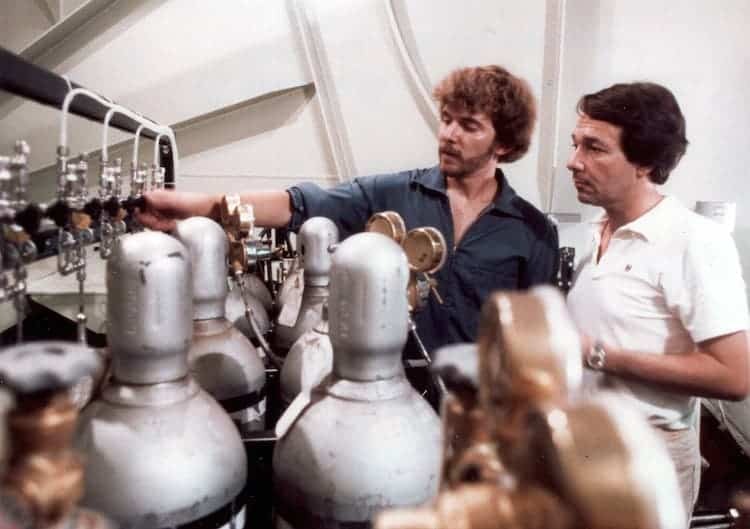 Exxon’s own scientists confirmed climate change – back in the 70s! As a new investigation showed today, the scientists of the biggest oil company in the world, Exxon Mobil knew about climate change back in the 70s – but Exxon still helped block the Kyoto protocol in the 90s and invests massive amounts of money into denying climate change. Today, 9 out of 10 funded climate change deniers can be linked to Exxon, despite evidence that they are fully aware of global warming happening. Exxon’s Esso Atlantic. Image via Francesco Castorina. Recently, an email from inside the company revealed that Exxon had data pertaining to climate change as early as 1981 – seven years before it became public issue. They ultimately chose to fund people to simply deny the problem instead of coming out publicly, but the history of how they did so is intriguing. In the email, Lenny Bernstein, a chemical engineer and climate expert who spent 30 years at Exxon and Mobil and was a lead author on two of the United Nations’ IPCC climate science reports, said scientists working with Exxon were completely aware of the connection between greenhouse gases and climate change. He said this in 1977! 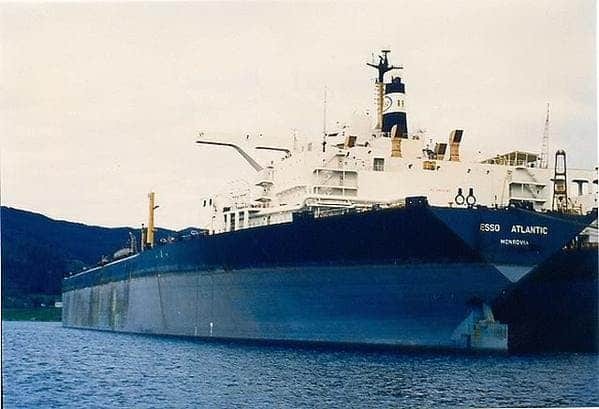 Exxon was so interested in the issue that they had a supertanker sailing through the Atlantic and taking carbon dioxide measurements to figure out how the oceans were absorbing CO2 and what the effects were. They even had scientists come up with climate models for the future, and the models all showed that we are causing a rising in global temperatures. Working together with external researchers, they developed models which all led to a consensus: global warming was already starting to happen, we were causing it, and it was really bad. Even admitting the uncertainties in their own models, Exxon’s own scientists were never afraid to speak about both the changes that were taking place in the Earth’s climate, and their effects. Black also understood the interests of the company he was working for, and realized that the corporation would come under scrutiny. He warned that there is a “connection between Exxon’s major business and the role of fossil fuel combustion in contributing to the increase of atmospheric CO2.” Nevertheless, he demanded that the results be published… and they were! It’s mind blowing to think about it today, but between 1983 and 1984, Exxon researchers published their results detailing how and why climate change was happening in least three peer-reviewed papers in Journal of the Atmospheric Sciences and an American Geophysical Union monograph. Roger Cohen, head of theoretical sciences at Exxon Corporate Research Laboratories, and his colleague, Richard Werthamer, senior technology advisor at Exxon Corporation were spearheading this research. The company prided themselves in doing research that no other company was doing at the time, and their feelings were echoed by many others. Exxon seemed determined to use their enormous resources to lead mankind into a more responsible future. But then, something changed. Sometime in the 80s, despite being fully aware of what they were doing by that point, they decided that money is money – and becoming a responsible company simply wasn’t profitable enough. Instead of walking at the forefront of science, they chose to invest massively into climate change denial. They lobbied to block any attempt at limiting emissions. They pay to eliminate environmental laws. They financed superficial, and sometimes even pseudo-science. They created a veil of misinformation that lasts to this day, and continue to be the main investor into climate change denial. Exxon helped to found and lead the Global Climate Coalition, an organization with other major oil and industrial companies seeking to halt governmental efforts to curb greenhouse gas emissions. They allied themselves with the American Petroleum Institute, a right wing organization which represents about 400 oil corporations and invests massively into pro-oil advocacy. API spent more than $3 million annually each year during the period 2005 to 2009 on lobbying, mostly to fight climate change control legislation. They spread their wings and reached out as much as possible in an attempt to leverage their resources into making people believe global warming isn’t happening. They knew what was happening; they had known for two decades already, and yet they chose not only to ignore it, but they chose to fight against the truth – for profits. The many millions of dollars they invested into lobbying and manipulating have long surpassed their investment in its climate vessel and models, and have likely paid off by now. 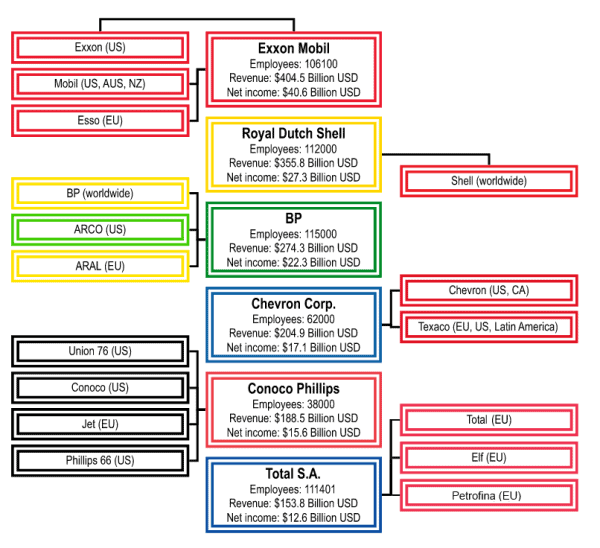 Chart of the major energy companies dubbed “Big Oil”, sorted by latest published revenue. Image via Wikipedia. Naturally, they also went from being praised and appreciated by the scientific community to being despised. In 2006, the Royal Society, the United Kingdom’s science academy, sent an open and very harsh letter to Exxon, accusing it being “inaccurate and misleading” when it comes to climate change uncertainty. In 2008, the company made a small concession, stopping support for some of their advocacy groups and pledging to never support climate change denial. In 2015, Exxon gave over $2.3 million to members of the US Congress to deny climate change and block efforts to fight it. According to a tally kept by Greenpeace, they’ve invested over $30 million in publicizing this denial, but the real sum is likely much larger than that. Inside Climate News published the first part of their investigation, and the second one will come out tomorrow. Be sure to check out their website for part two.